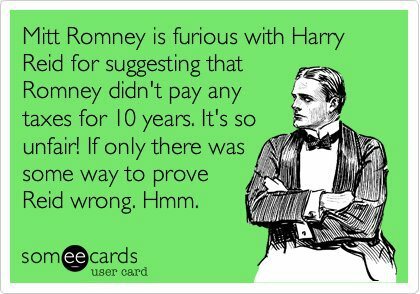 Romney continues to complain about Harry Reid’s claims that Romney paid no taxes for ten years. I don’t believe Reid either but at least this probably unfair attack differs quite a bit from the types of attacks which come from Republicans. The Swift Boat Liars didn’t stop when John Kerry released his military records (and I’ve seen a number of right wing blogs which deny the fact that he did so). Releasing the usual birth certificate didn’t shut up the Birthers, and some even persist with their absurd claims after the long form was released. While Harry Reid’s claims are unfair (assuming they are untrue), Romney could end this by simply doing what he should have done in the first place and release his tax returns. Posted in Mitt Romney, Scandals. Tags: Harry Reid, Mitt Romney. RSS feed for comments on this post.. TrackBack URL. What is the only issue for which Mr. Romney has not flip-flopped? He stands firm on one thing: not releasing his tax returns. Why so firm on this issue? Mr. Romney is running for President of the United States. This is a position of Trust. 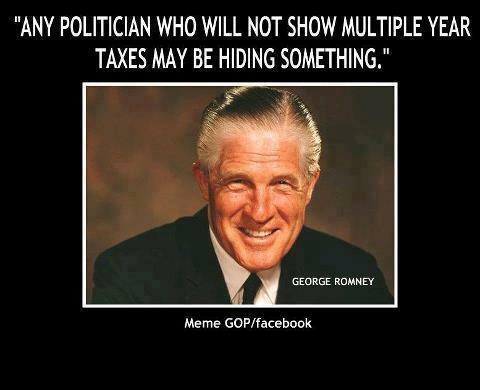 Mr. Romney has said, “Trust me,” re his tax returns. It is not unreasonable for voters to want to “Verify. It is not just liberals who want to see Romney’s tax returns. It is 63% of American voters who do. The longer Mr. Romney delays, the more suspicious it appears. What is the problem, Mr. Romney? Release your tax returns.